Austrian Glacier skiing in October and November – what to expect? We have seen more calls this year for early season and glacier skiing in Austria. One question always arises – ‘what is it like’? Having skied the glaciers in Austria for 9 years now my experience is a very positive one overall. Personally I like the cold and November into December can be bitingly cold. It was only last week that there were rumblings about the lack of snow of the glacier in Tirol but this last week it has arrived and for anyone on the Hintertux Glacier, Stubai Glacier, Pitztal Glacier or the Rettenbach and Tiefenbach glaciers at Solden then the conditions will be superb this week – the Hintertux Glacier has had a metre of new snow so far this week and the views from the webcams were sensational. Some people think that the glaciers will be deserted at this time but this really isn’t the case – if you are expecting empty pistes then you will be disappointed. As well as the race training taking place there are very many skiers and snowboarders who have been chomping at the bit to get on skis or snowboards and with the conventional ski areas not opening till November the glaciers are generally well used if not as much as at the height of the winter – weekends are busy but mid-week is far calmer. The terrain on the glaciers varies, the Stubai Glacier is generally pretty lumbering and gentle with little steep terrain actually on the glacier sections. 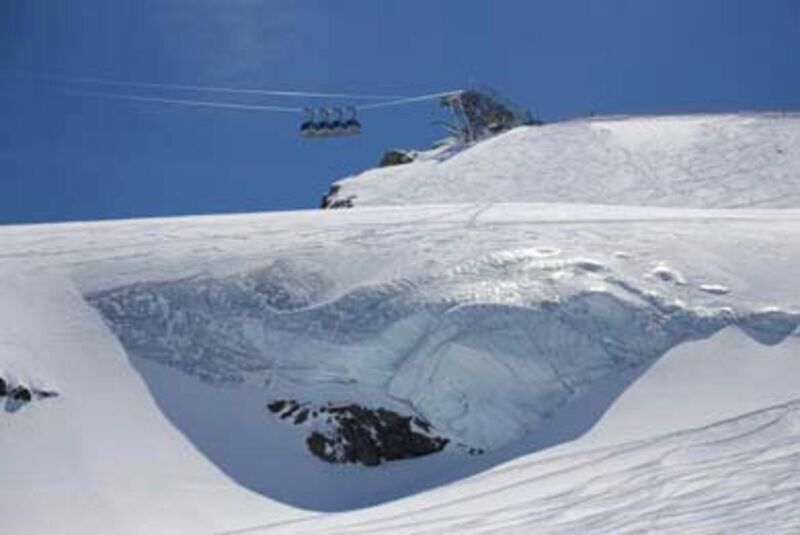 The pistes linking the glacier sections can offer steeper terrain but it is the Hintertux Glacier, the Rettenbach and Tiefenbach glaciers at Solden and the Pitztal Glacier that offer steeper terrain – the glaciers there have a steeper descent than the Stubai Glacier. In terms of the resorts at this time of the year that serve the glaciers then again, expect a bit of life during the weekends and less during the week. Neustift is the place go for the Stubai Glacier, whilst the Pitztal Glacier and Hintertux Glacier have resorts at their base-stations, Solden accesses the Rettenbach and Tiefenbach glaciers.